The Niagara County Law Enforcement Academy graduated its 63rd class during a ceremony held Jan. 11, 2017, at Niagara University’s Castellani Art Museum. New York Assemblyman Angelo J. Morinello served as the ceremony’s keynote speaker. After turning the podium toward the graduates, Morinello offered wisdom ascertained from his formidable experience as an attorney and 14-year tenure as a Niagara Falls City Court judge. Morinello, who was elected to his first term in the State Assembly in November, reminded the 17 men and women that they are being thrust into roles as stewards of the community, and that it is their duty to serve and protect. “Always follow the rules of your oath. Respect yourself, respect your community, respect your faith. Come to work with a clear head. Leave personal distractions at home so you can assure yourself that you are going to come home,” he said. Talon Zuchlewski, the class president, expressed his appreciation for the support of family, friends and academy instructors over the last six months. He said that he believes that the graduates have been adequately prepared for lives as public servants. 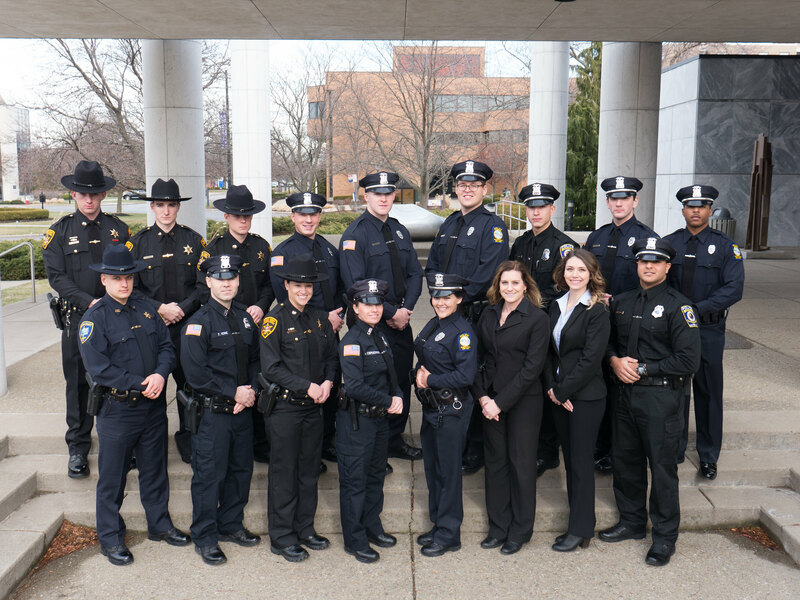 The NCLEA was established at Niagara University in 2011, making NU the only four-year, private college in New York to host a full-time police academy. Coordination of the program on Niagara’s campus is undertaken by the university’s Office of Continuing Education and criminal justice department. Several Niagara University administrators were in attendance at the graduation ceremony, including Dr. Debra Colley, executive vice president, and Dr. Timothy Ireland, interim provost. In her closing remarks, Dr. Colley tied the noble responsibilities of law enforcement officers with the Catholic and Vincentian mission of Niagara University. Applications for the police academy’s next class are now being accepted. For more information, please call 716.286.8181, visit the website at www.niagara.edu/nclea or email ude.aragain@aelcn.